Steve Aoki & Autoerotique vs. Dimitri Vegas & Like Mike - Feedback (Original Mix) | zippytrack | Search for new music. 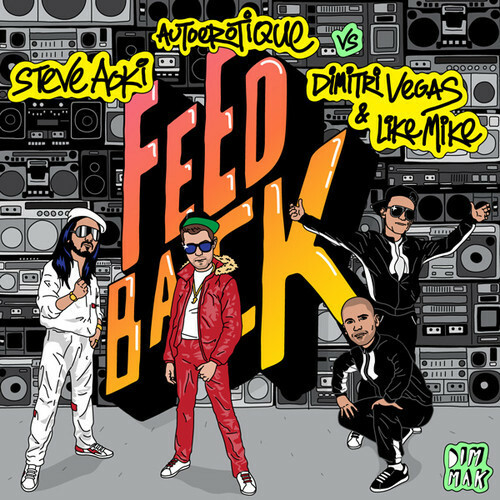 Electronic music titans Steve Aoki, Dimitri Vegas & Like Mike, and Autoerotique join forces as the ultimate dance supergroup for new track “Feedback,” out February 7 on Dim Mak Records as a Beatport exclusive and available wide February 25 via all digital retailers. “Feedback”—which was teased in the official Tomorrowland 2013 aftermovie, currently boasting over 44 million views on YouTube—masterfully combines the production prowess of each individual artist into one bass-heavy anthem: Aoki pumping the electro house intensity, Dimitri Vegas & Like Mike bringing the big room house sound, and Autoerotique blaring the bass. The booming rhythm and deafening drop will hype festival-sized crowds and nightclub dance floors across the globe.